Dr Mark Watson is Head of Education and Development at CRDI (formerly MMI) where he is responsible for identifying new partnerships and strengthening links within CRDI’s existing network. Dr Watson is an investigator in CÚRAM, the SFI centre for Research in Medical Devices and has experience in coordinating structured PhD programmes for medical and science graduates, such as the MMI Clinician Scientist Fellowship Programme (CSFP). 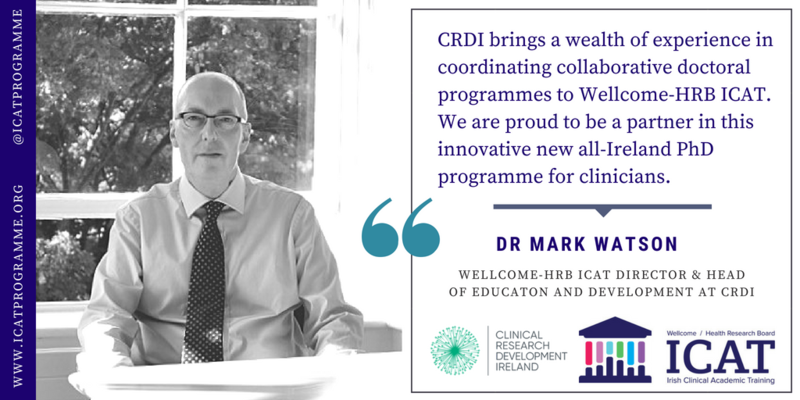 Dr Watson joined CRDI in 2003 from the Wellcome Trust. Dr Watson is a Co-Director of the Wellcome-HRB ICAT Programme.